Board Know More: Star Wars: Empire vs Rebellion. 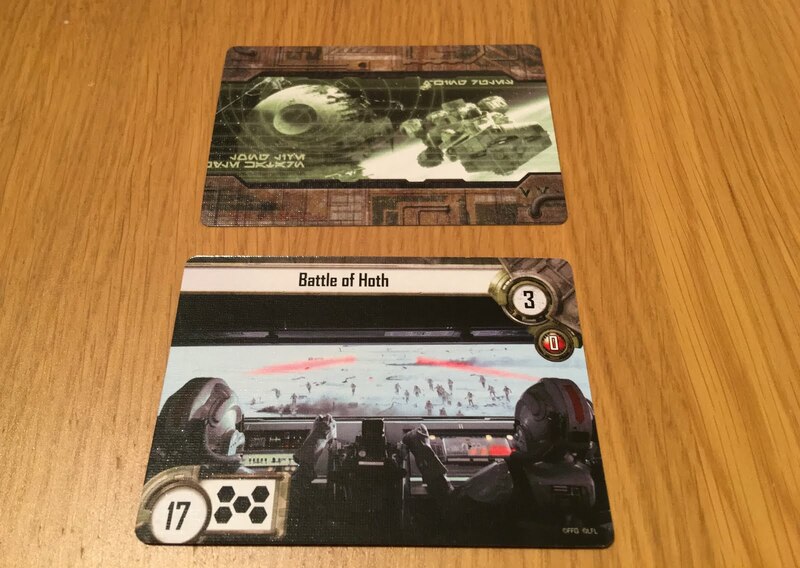 Star Wars: Empire vs Rebellion. Time to play: 60 minutes. Mike: A big thank you to Esdevium Games for our review copy. You can find your nearest game store using their handy store locator. Star Wars: Empire vs Rebellion is a 2 player strategy card game with a small amount of deck building. It is a re-theme of a game called Cold War: CIA v KGB released in 2007. Before we mention the main game in the rules there is a little tutorial that helps you learn the game. Honestly, we think this is largely pointless and not worth it as the game itself isn’t complex to learn. The tutorial is also a little bit flat and may put you off the main game which has a lot more depth. The winner is the first player to get to 7 or more victory points. 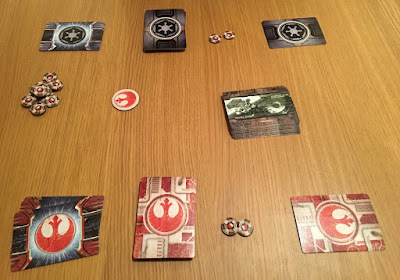 Before the game starts one player will be Empire the other the Rebellion. You then take that factions deck and add 4 of the 8 available characters to it. 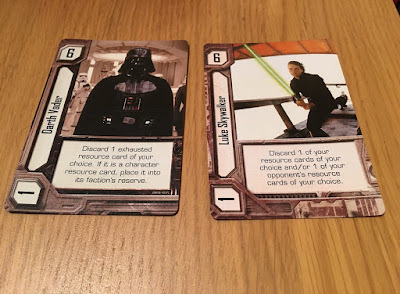 This is the only deck building choice you will have in the game so pick the characters that match your style of play. Two Characters i'm sure will be in most decks. David: Yes the tutorial was a bit boring as it finished quickly and didn’t really help us with the game. There are more complicated card games than this and once you get going it’s very easy to play. I like being able to choose what characters to add to the deck as it mixes the game up a little bit each time. Mike: Once we have set up the game and each got our decks we flip the balance token to see who goes first. This is a token that is imperial one side and rebel on the other and used to keep track of who is the first player. David: The game has 3 phases. A Planning phase, Struggle phase and Dominance phase. In the planning phase, you reveal an event. This will be an event from one of the original trilogy films. For example, attack on echo base or duel on cloud city. Mike: Let’s take a closer look at one. In this picture, the round will be Battle of Hoth. It is worth 3 victory points and 0 influence tokens (white and red numbers top left). You need to score as close to 17 as possible without going over to win this event and not use more than 5 cards (the five hexagons net to the 17 show this). Based on this event players now choose one of their five strategy cards. Each player has the same five so it can be to you advantage in the later rounds to remember what ones your opponent has played. This is because once you have used a strategy card it stays out of play until you have used all five. Once this has happened you get them all back. This can be a crucial part of the game as knowing what strategy your opponent has played can help give you the edge to win an event. David: After the planning phase we get to play our cards in the struggle phase. You can take one of four actions. Play a card, use a power on a card, Spend influence or pass. When you play a card you play one from the top of your deck you never have a hand to choose from. This can be risky as it could push you over the event limit. You need to think about if you want to make the gamble. 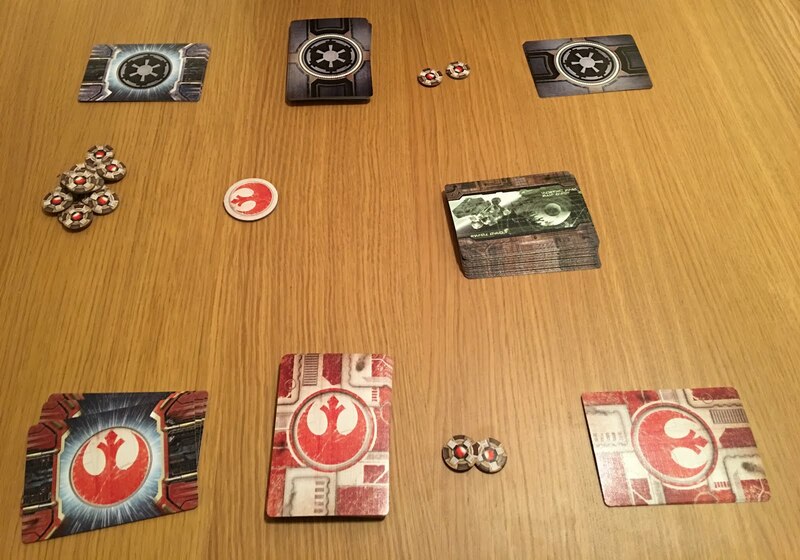 The cards in the picture above would add 4 to the score for the empire and 5 for the rebels. Using a power on a card is simple you turn the card 90 degrees to exhaust it and do what is in the text. This could be discarding an opponent’s card or exhausting one of their cards for example. Spending influence lets you use the influence tokens you get to refresh your exhausted cards. These can be really useful. If both players pass in a row the phase ends and it’s on to the last phase. Mike: Yes playing a card blind from the deck can be risky and feels a bit like blackjack. It can either help you or make you go bust. As David has mentioned once both players have passed we go to the dominance phase. In this phase both players reveal strategies and then work out who has claimed the event in the middle. The player who is closest to the event score without going over wins that event and keeps the card. First to seven points wins the game. The game time on the box suggests 60 minutes but none of our games ever reached that point. I would say it was closer to 30 minutes. David: It’s a great filler game before playing something bigger. I do prefer star wars timeline to this game though. For me, I prefer deck builders that I can have more control over during set up. I’m not sure I like the way we just turn cards over and don’t have a hand to play from. Again there is not much control the player has. Mike: I know what you mean it is a bit odd playing cards blind from the deck. This does make it a bit push your luck. But I really like this aspect of the game as there is that gamble of getting as close as you can without busting the limit. I disagree about this Star wars Timeline being better. 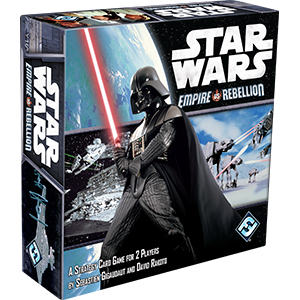 I would much rather play a game of this as I know that I could play this with non Star Wars fans as well. It’s a difficult one to review as it is a game we would go back to but there are others that play better. At the reasonable price, it's worth picking up and adding to your collection if you want a simple strategy game filler. It will leave you wanting more though and you will need to look at a deck builder or the Living Collectable Card games that Fantasy flight offer to quench your thirst. I'm sure it has sold a few more units being Star Wars than CIA v KGB. I wanted a bit more - maybe the Star Wars LCG delivers on this. Board Know More’s 10 x 10 Challenge.